So, the magic circle has been completed and the boundary has been paced. 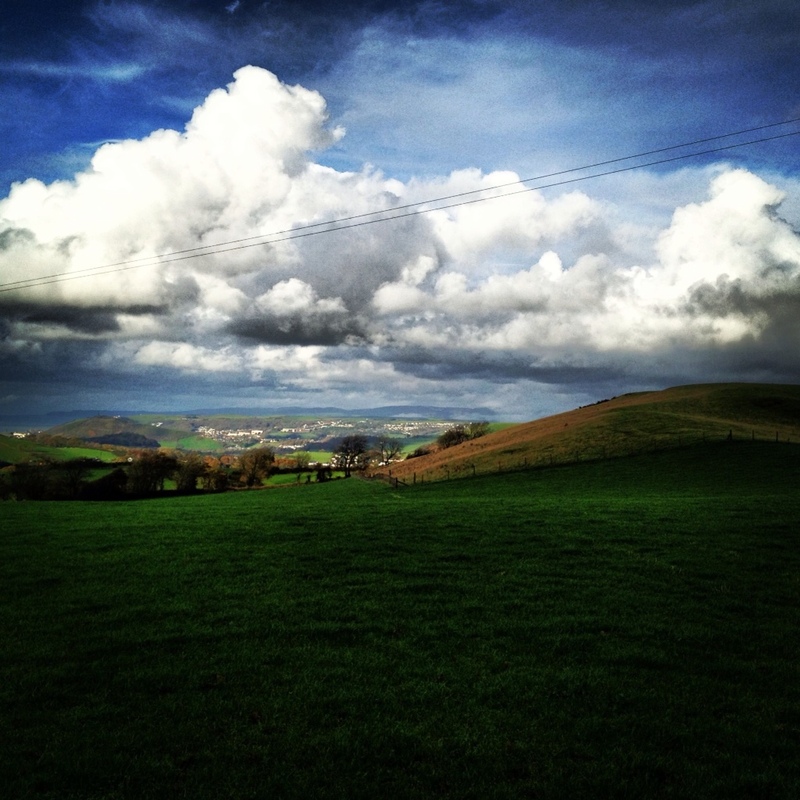 Chico and I are perimeteers – we walked around the whole of Wales, and nothing really terrible happened. We are both still alive, healthier and musclier than ever before, both deeply in love with walking, and fairly fond of each other too. Take two donkeys into the shower? A few weeks ago I picked up Flo, a mostly sweet little off-white donkey who is hopefully going to be a good buddy to Chico in his field over the winter. 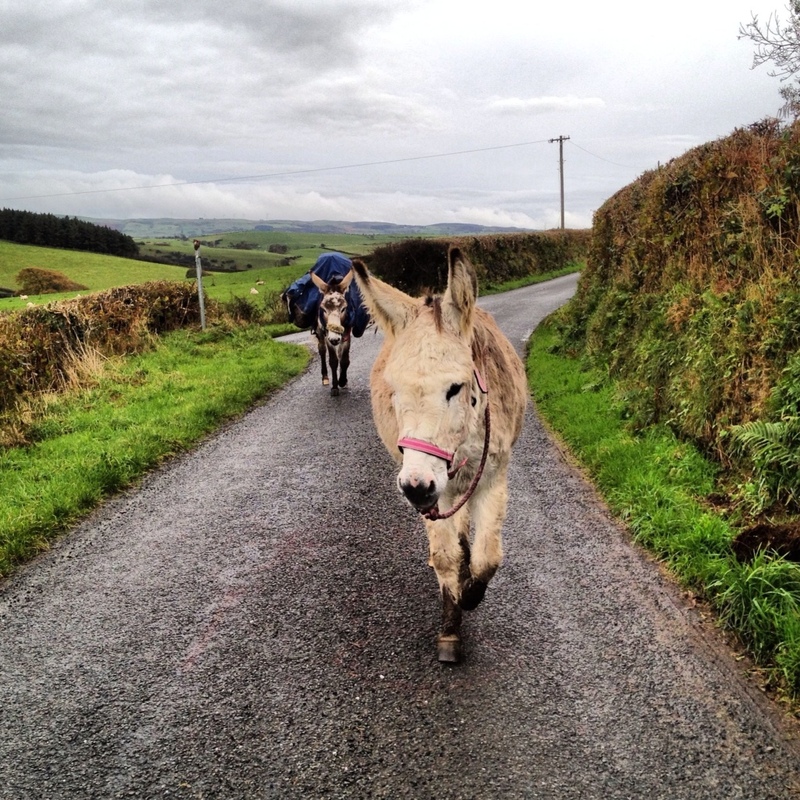 And a few days later Rhys joined us for the last week, wholeheartedly welcome as leading two donkeys is beyond my power. Our hairy little family took the last week at an all-time record dawdle – partly to take things easy for the sake of Flo’s unpractised hooves and significant tubbiness, partly to arrive back in Aberystwyth on a party-friendly Saturday afternoon, and partly to savour the last days of this long adventure. Most adventurers would have finished their trip at a run, chasing a world record or escaping encroaching sea ice, but we found ourselves hanging about a bit, and generally in the rain. Still, thanks to various confounding factors: the detours to avoid the grimly relentless A487 which hogs all of the best coastline for the last 30 miles, a number of bridleways that didn’t really exist, significant mud, exuberant gorse, and a brilliant very full, very brown and very cold ford crossing in flip-flops (up to Flo’s middle), the dawdle didn’t feel too easy. And so we came to get our first glimpse of Aberystwyth last Friday afternoon, rounding a corner on a track I’ve never been on before. Pen Dinas, the hill with a tower on top that hems the town in to the south, hove in sight through atmospherically low cloud. We decided to give the donkeys a rest and get the stove out for a cup of celebratory tea and brandy (we were dawdling, don’t forget). Before the billy boiled that low cloud had brought its atmosphere right over to meet us – a thorough soaking of giant raindrops that filled the air. 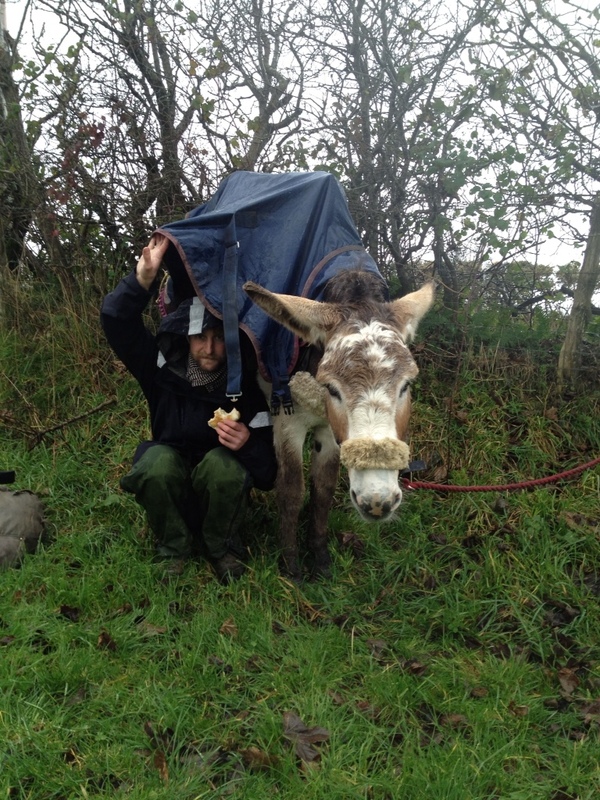 Rhys joined Chico under his rain mac, which Chico didn’t seem to mind. I watched the drops dilute my pan of tea, make a garlicky milk of the Boursin and soak into the rolls. Ten minutes later the brown cloud was done with us and passed along to water the other side of our hill, and bright sunshine rolled over Aberystwyth and up the hill towards us, prising beams between towering white clouds of a whole different character. Aberystwyth seemed to have reached over and greeted us, perhaps like spitting on a hanky and rubbing us clean in time for arrival. We camped nearby, in the garden of Titch and Maz, friends of friends of my mum. 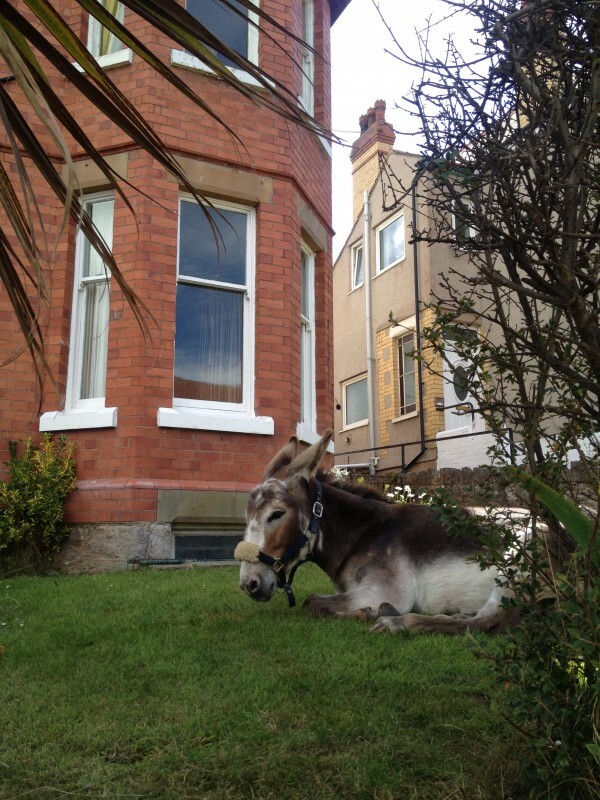 The garden came pre-tested – it used to host the vicar’s donkey whenever the vicarage grazing was exhausted. And in the morning, after falling asleep at 8.30pm (four hours of darkness being as much as we can entertain ourselves for before sleep is the only remaining idea), we joined the disused railway cycle route into Aberystwyth. I’d invited people to see us in at the far north end of the prom, where there’s a low rail that people kick to mark the turning point of a stroll. Despite the utter terror as I passed this way five-and-a-half months ago, clinging to the rope of a half-wild donkey, scared of the waves in the crashing rain, I’d managed to kick the bar on my way north, and now we were about to return to it from the south. As we got closer people came towards us, three of the most important people of the early days, none of whom knew each other. David Evans, the harness maker who with such devotion figured out and made the pack saddle which survived a lot of wilful battering into trees, gates, electric fences etc; Tamlin Watson, the Donkey Sanctuary welfare officer for half of Wales who gave me a crash course in very gentle and empathetic donkey care before departure, and came to give me a little more along the way too; and Carol Limmer, to date the only donkey-walker I’ve met, who provided very practical northern phone support along the way, regularly just encouraged me to swear cathartically about the confounding ways of donkeys, and came all the way down from Lancashire to see us home. Utter angels. The end of the prom was full of people, many I didn’t even know, including Facebook friend Alan who’d come all the way over from Birmingham. 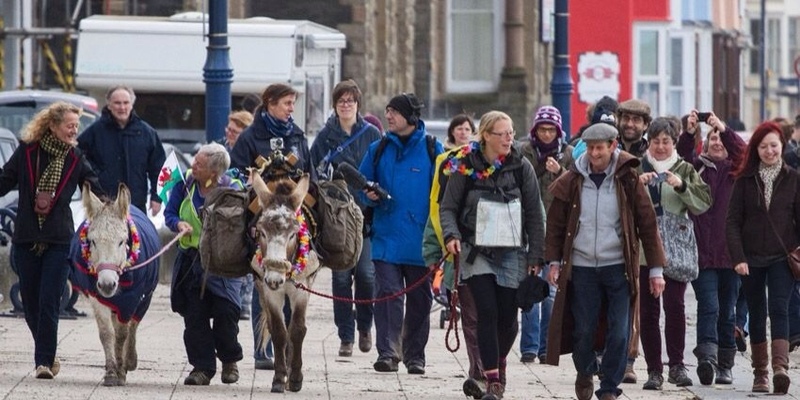 People who we’d met on the walk had come from all compass points – Kay from near Caernarfon, sisters Fran and Ann from the Gower, Katie and Dominic and baby Etienne from Builth Wells, Jane from the first night and Maz from the last. An old friend, Rhiannon, appeared with a new baby who wasn’t even showing as a bump when we left. And dozens more people too, all crunching on the pebbles and black sand that the storms have flung up onto the prom. The donkeys and I wore flower garlands, and mum and her Harry had tied rainbow balloons and bunting to the bar. Thank you everyone who came and everyone who wrote such sweet messages on the blog, Facebook and Twitter – I felt like a golden child, somewhere between walking down the aisle and starring in a Bollywood finale, and the donkeys, fed horse nuts by all the children present, were patient and brilliant in their flowers. Everyone got cold, standing about in the November seaside chill, except me. I’m so warmed by hugs and triumph and a little embarrassment at summoning people to look at me that I think I could camp wild until spring. Photos 1, 4 and 5 by Alan Hale – thank you VERY much for them, Alan. I didn’t manage to take a single one. And thanks for the carrots too! I so admire what you did, and enjoyed your blogs. I hope you can write your book soon because I know it will be a success. Well done to you all!! We met you briefly outside Deeside College in North Wales just before you made camp at Wepre Park! Seems so long ago but only yesterday as the saying goes. Wonder what is next for you and Chico – just can’t see you sitting in an office 9-5 Monday to Friday! All the best in whatever you choose to do! What an achievement Hannah! Well done! Sorry I wasn’t there to welcome you but it looks as if you had a good turn out and a supportive crowd. Fantastic! I can’t believe you made it – well, I can, but it just seemed you had such an impossibly huge task ahead of you back in June when you found yourselves navigating the Llyn. It was such a privilege to have you visit us. 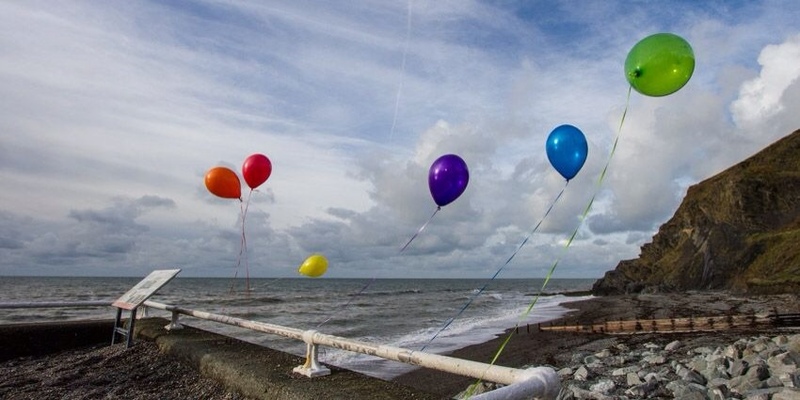 I only have one request – Can you do it again so you can return to Aber on a day that I am free to join in the celebrations in greeting you home again!! Well done to you & Chico & all involved. Well done & a HEARTY Congratulations Hannah, Chico, Rhys, and Floss! You did it!! Hannah…just amazing. You were such a novice when you began this journey and now you and Chico have come through so much together! He will never forget this (donkeys don’t forget ya know) and neither will you. What a friendship you have …such trust! Well done to the 4 of you. Met you twice in north Wales near Bangor and then a couple of weeks later at Holywell. Both times my dog looked at Chico and Chico looked at him with a look of ‘just try it’ on his face. 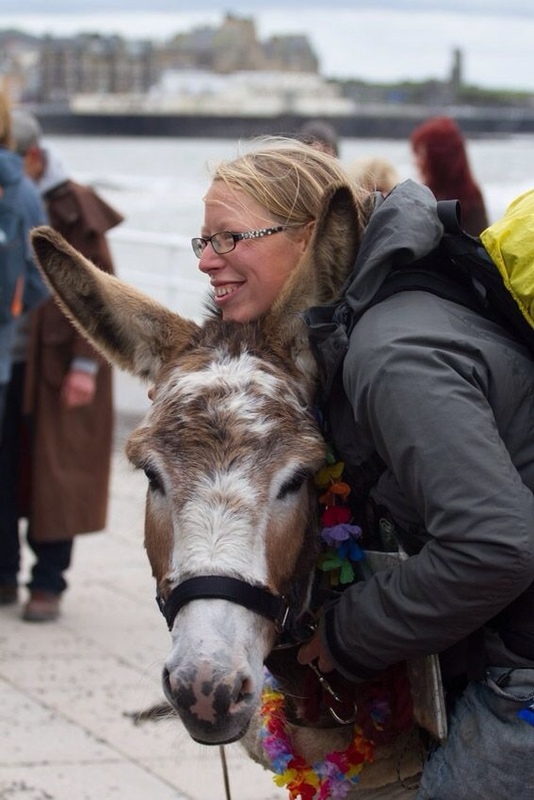 All the best for the second part of your journey and looking forward to you kicking the railing at Aber when it’s completed, afterall every bookshelf needs to have a book about a woman who decides to walk around a country with a donkey and then does it! Fantastic You made it. I’m looking forward your fantastic book with the details of the trip. I also love walking long distances although I haven’t been able to do it for quite a while now. In our family, from our grandparents time kids had a donkey to love and play in the summer holidays that took my grandfather and his brother, and then another one for my father and his brother and finally my generation to the family fields. We loved! Lovely Paul and Angie! I’m glad to hear you’ve made the move so smoothly, although I’ll always remember you in your hilltop castle! 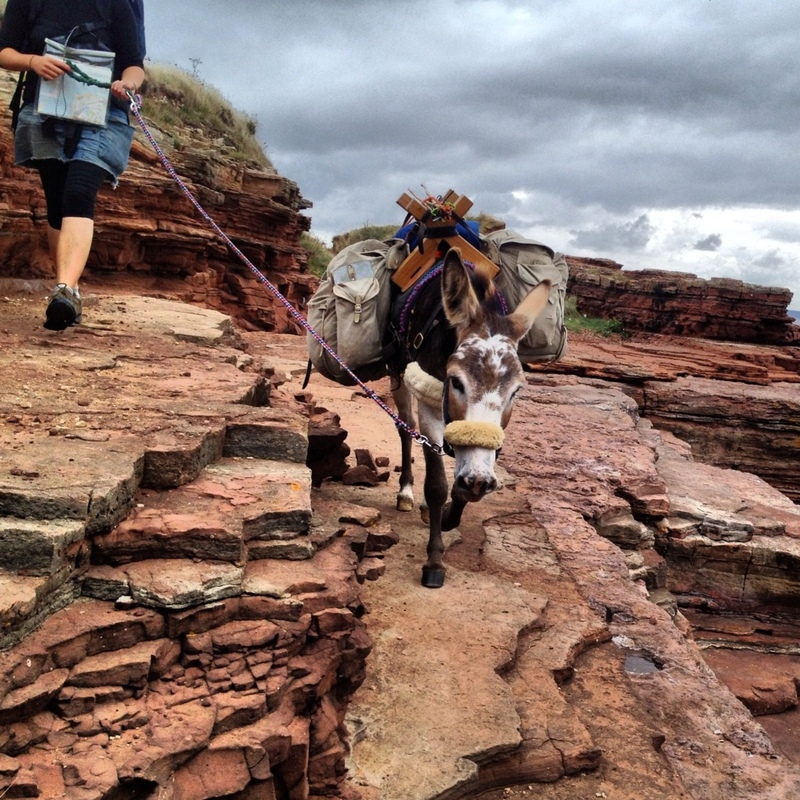 Have an amazing time in Peru – spot some burros for me! In the meantime here’s a picture of Chico chilling out in your front garden! Glad you managed to finish the journey. I have wondered “what comes next” and if you would get a companion for Chico chops. We met briefly in Bagillt (me the OH and the dog.Hope your 2014 is very special and fun. All the best.